Polenta is a great addition to cakes, it produces a lovely grainy texture and is also an excellent gluten-free alternative. 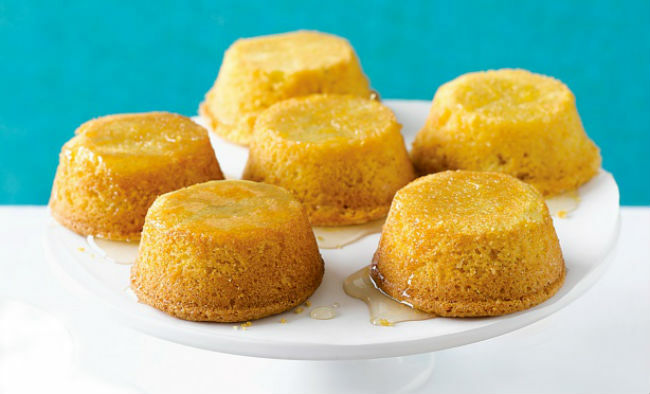 These lovely lemon cakes are an easy afternoon tea option. 1. Preheat oven to 180°C/160°C fan-forced. Grease a 12-hole, 1/3 cup-capacity muffin pan. 2. Using an electric mixer, beat butter and sugar until pale and creamy. 4. Sift polenta and baking powder over butter mixture. 5. Add pure ground almonds, lemon rind and lemon juice. Stir to combine. 6. Spoon mixture into prepared holes. Smooth tops. 7. Bake for 25 minutes or until a skewer inserted in the centre of 1 cake comes out clean. 8. Cool in pan for 5 minutes. Transfer to a wire rack over a baking tray. 9. Meanwhile, make lemon syrup: combine sugar, lemon rind, lemon juice and 2 tablespoons cold water in a saucepan over low heat. 10. Cook, stirring, for 5 minutes or until sugar has dissolved. 11. Increase heat to high. Bring to the boil. 12. Boil, without stirring, for 2 to 3 minutes or until slightly thickened. Remove from heat. 13. Carefully pour syrup over cakes. 14. Set aside to cool completely. Serve.